I live in the desert. I’ve lived here my entire life. It’s brown. It’s dusty. It’s hot. It’s beautiful. Truly. When I go out on a hike… once I reach the top, I stand there and just look out across the valley. It’s breath taking. I know it’s hard to imagine if you’ve never been here, but trust me… it is. But it’s more than just a beautiful view. There’s beauty in unexpected places. I stumbled upon a tiny cactus not too long ago. It’s growing in my front yard. This tiny cactus is partially shaded. It goes unnoticed for the most part. 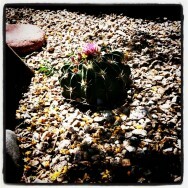 And growing right on top of the tiny cactus, is a lovely, little, pink flower. I had to take a picture. It was just perfect. But sometimes, these perfect, beautiful moments can hurt us when we least expect it. We reach out to touch the beautiful cactus and it angrily pokes us. Even though we’ve done our best to treat it well and provide for it’s needs… it hurts us. Why is it, that just when we think we’re a part of something beautiful, it turns out to be a difficult experience? I’m slowly discovering that even in the most hurtful experiences, there’s beauty. 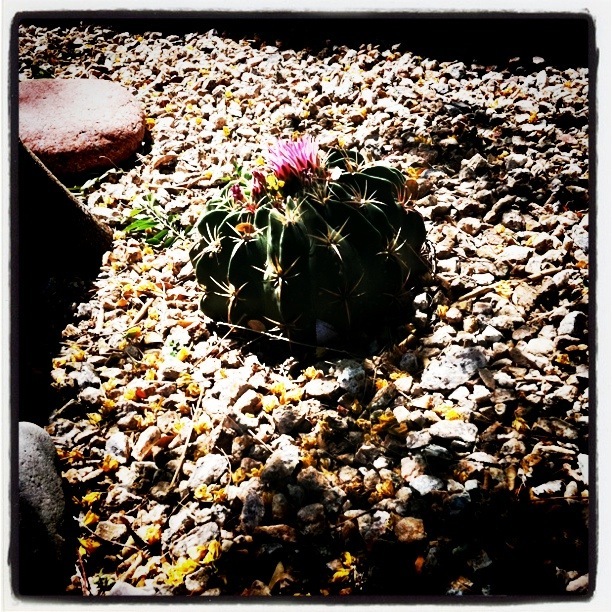 Not just temporary adornment, like the cactus flower, but real, lasting beauty. An even better experience is awaiting us. Sure, being poked was an uncomfortable experience. It was an experience we wanted to avoid… But being poked causes us to grow and learn. Beyond the hurtful spines in life… is a beautiful flower. Getting to it can be painful, but what we learn along the way shapes who we are. I think we appreciate the more beautiful moments in life when there was difficulty in getting it. It’s these growing pains, obstacles, and other tests in life that define for us what we really value. If the goal or object was easy to get it becomes devalued, a faded memory, or a passing fancy.